Dave looks like a nice design, well done. I wonder if you can modify the shoulder strap so that the case could be used as small back pack with shoulder straps? I always go back and forwards about cameras for trips, whether it should be a DSLR or something lighter. These days I carry a Ricoh GX100, which gives me some of the benefits such as RAW and wide angle, but it is not an SLR. That looks good, it's a similar method to the WW2 style British Army waterbottle carrier. Have a enjoyable, relaxing, adventurous and beautiful time in Norway! Mac E: That WW2 water bottle looks so home made! All amazed that we got a result. Love the cork. 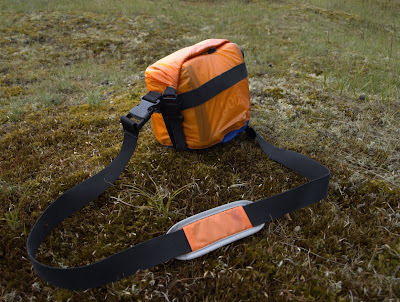 Hendrik: I would say that, of the three Pod bags I ordered the orange one was the one that fitted best. However, your explanation may work better. Perhaps after so long here it's seeping into my subconcious. Roger: Link clearly doesn't get you to where I intended. 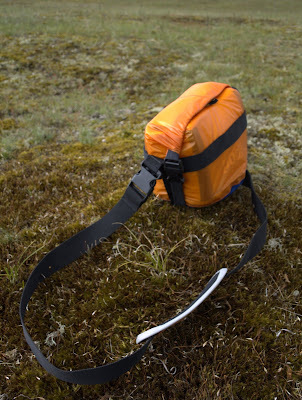 You'll have to navigate to Backpacks and then check out the Drypack lite.